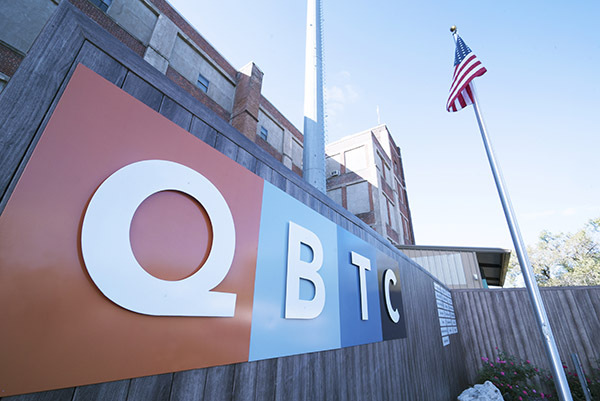 The Quincy Business & Technology Center (QBTC) is a business incubator that serves as a pivotal launching pad for business operations having the potential for creating wealth and adding to the Quincy Area economic base. Our facility at 301 Oak Street in Quincy, Illinois consists of 67,000 square feet on five floors. The QBTC building boasts office space for rent, larger office suites for rent, and commercial rentals at any size, including combination office and light industrial space. Warehouse space is available as well. Both passenger and freight elevators make access easy for your staff, customers, and vendors. The QBTC environment fosters engagement between businesses in a collaborative atmosphere. The opportunity for peer-to-peer communication of successes and challenges helps entrepreneurs know there are other business owners facing similar issues. The success rate of our resident companies has been outstanding. More than 25 businesses have prospered and graduated to other locations in the past ten years alone. Businesses that are currently a part of the QBTC account for more than 140 jobs. We connect clients to the following programs, funding opportunities, and entrepreneurial resources that accelerate growth and profitability for their businesses. Together we will look at the specific needs of the business and match you to the most opportune resources. Confidential review of financial documents by the Small Business Center team. Provides all of the necessary resources to build a successful business.